Share the post "Fibroid Awareness Week"
Fibroid Awareness week is finally here! Read on to find out more about the purpose of this newly launched effort and how you can gain more information about fibroids and the embolization procedure. Concern for the high number of unnecessary hysterectomies and dissatisfaction with other treatment outcomes led Dr. McLucas to become a non-surgical treatment advocate. His goal, and the mission of FTC, is to ensure women with fibroids know all the options when it comes to treatment. FTC advocates embolization as a safe alternative to other fibroid treatments. In gynecology, embolization was used to reduce bleeding during uterine surgery. Founding members of the Fibroid Treatment Collective noticed another important effect. It shrank fibroids. The promise of an effective, non-invasive treatment led to research, trials and medical acceptance. Today more than several hundred thousand women world-wide have found relief with this safe, simple procedure. The Fibroid Treatment Collective performed the very first fibroid embolization in America, and has perfected the procedure with thousands of successful treatments to date. Dr. McLucas is one of the only gynecologists in America accredited in the skills necessary to perform embolization. 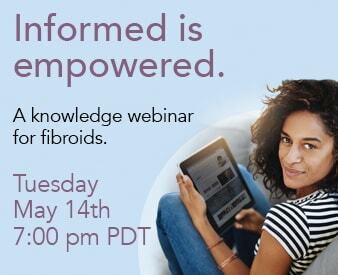 Women interested in learning more about Fibroid Awareness Week can join a live chat Monday through Friday from 9 a.m. – 5 p.m. PDT and Saturday and Sunday 12noon to 4pm PDT. Just click on the green Live Help button on the left. We encourage anyone and everyone who knows someone with fibroids, or are themselves affected by fibroids, to participate in the annual Fibroid Awareness week! For more information on Fibroid Awareness Week or fibroid treatment, contact us online or call 866.362.6463. You can also Twitter the Fibroid Treatment Collective at @fibroiddoctor and become a Facebook fan at Fibroid Treatment Collective!